 Hittites is the conventional English-language term for an ancient people who spoke an Indo-European language and established a kingdom centered in Hattusa (Hittite Hattushash) where today is the village of BoazkÐy in north-central Turkey, through most of the second millennium BC. The Hittite kingdom, which at its height controlled central Anatolia, north-western Syria down to Ugarit, and Mesopotamia down to Babylon, lasted from roughly 1680 BC to about 1180 BC. After 1180 BC, the Hittite polity disintegrated into several independent city-states, some of which survived as late as around 700 BC. The Hittite kingdom, or at least its core region, was apparently called Hatti in the reconstructed Hittite language. However, the Hittites should be distinguished from the "Hattians", an earlier people who inhabited the same region until the beginning of the 2nd millennium BC, and spoke a non-Indo-European language conventionally called Hattic. Hittites or more recently, Hethites is also the common English name of a Biblical people who are called Children of Heth. These people are mentioned several times in the Old Testament, from the time of the Patriarchs up to Ezra's return from Babylonian captivity; see Hittites in the Bible. The archaeologists who discovered the Anatolian Hittites in the 19th century initially believed the two peoples to be the same, but this identification remains disputed.The Hittites were also famous for their skill in building and using chariots. Some consider the Hittites to be the first civilization to have discovered how to work iron, and thus the first to enter the Iron Age. The first archaeological evidence for the Hittites appeared in tablets found at the Assyrian colony of Kultepe (ancient Karum Kanesh), containing records of trade between Assyrian merchants and a certain "land of Hatti". Some names in the tablets were neither Hattic nor Assyrian, but clearly Indo-European.  The script on a monument at Bogazkoy by a "People of Hattusas" discovered by William Wright in 1884 was found to match peculiar hieroglyphic scripts from Aleppo and Hamath in Northern Syria. In 1887, excavations at Tell El-Amarna in Egypt uncovered the diplomatic correspondence of Pharaoh Amenhotep III and his son Akhenaton. Two of the letters from a "kingdom of Kheta" - apparently located in the same general region as the Mesopotamian references to "land of Hatti" - were written in standard Akkadian cuneiform script, but in an unknown language; although scholars could read it, no one could understand it. Shortly after this, Archibald Sayce proposed that Hatti or Khatti in Anatolia was identical with the "kingdom of Kheta" mentioned in these Egyptian texts, as well as with the biblical Hittites. Sayce's identification came to be widely accepted over the course of the early 20th century; and so, rightly or wrongly, the name "Hittite" has become attached to the civilization uncovered at Bogazkoy. 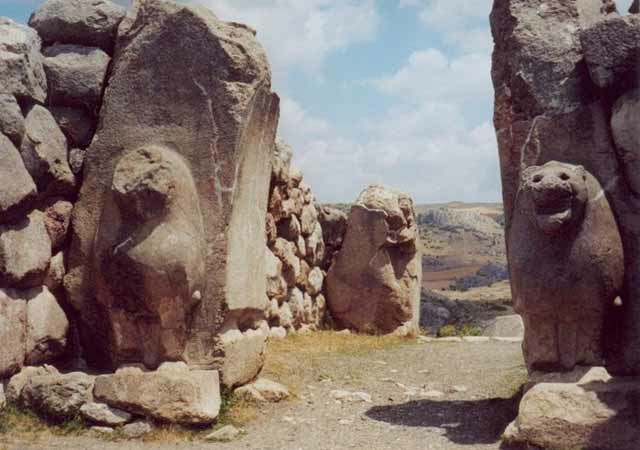 Two sculptures of life-size lions, each weighing about 5 tons in antiquity, have been discovered in what is now Turkey, with archaeologists perplexed over what the granite cats were used for. One idea is that the statues, created between 1400 and 1200 B.C., were meant to be part of a monument for a sacred water spring, the researchers said. The lifelike lions were created by the Hittites who controlled a vast empire in the region at a time when the Asiatic lion roamed the foothills of Turkey. Hittites seemed to have spoken a language from the Indo-European language family, which includes English, German, Greek, Latin, Persian, and the languages of India. Hittite tablets were excavated from the ruins of the ancient Hittite capital Hattusa located near the modern Turkish town of Boghazkoy about 210 kilometers east of Ankara. Scientific excavation of these ruins by a German expedition began in 1906. About 10,000 clay tablets script were recovered. Although some were written in the Akkadian language and could be read immediately, most were in an unknown language, correctly assumed to be Hittite. Within ten years the language had been deciphered, and a sketch of its grammar published. Gradually, the international community of scholars, led by the Germans, expanded the knowledge of the language. The number of common Hittite words that one could translate with reasonable certainty increased steadily. Glossaries published in 1936 by Edgar Sturtevant (in English) and in 1952 by Johannes Friedrich (in German) admirably served the needs of their contemporaries. Yet today, seventy-five years after the decipherment, there still exists no complete dictionary of the Hittite language. References to a people whose name is transcribed into English as "Hittites" (or sometimes "Hettites") are found throughout the Hebrew Bible. These Biblical references to the Hittites are summarized below. It should be noted that the corpus of the Hebrew Bible was probably compiled in its near-final form between the 7th and 5th centuries BC, during or after the Babylonian exile, as related in the Book of Ezra, with a further revision in the Masoretic text occurring some time between ca. 200 BC and 100 AD, as inferred from textual analysis of the Septuagint, Dead Sea Scrolls, and other sources. Given the casual tone in which the Hittites are mentioned in most of these references, Biblical scholars before the age of archaeology traditionally regarded them as a smaller tribe, living in the hills of Canaan during the era of the Patriarchs. This picture was completely changed by the archaeological finds that placed the center of the Hatti/Hattusas civilization far to the north, in modern-day Turkey. Because of this perceived discrepancy and other reasons, some Biblical scholars reject Sayce's identification of the two people, and believe that the similarity in names is only a coincidence. In order to stress this distinction, E. A. Speiser called the Biblical Hittites Hethites in his translation of the Book of Genesis for the Anchor Bible Series. On the other hand, the view that the Biblical Hittites are related to the Anatolian Hittites remains popular. Apart from the coincidence in names, the latter were a powerful political entity in the region before the collapse of their empire in the 14th-12th centuries BC, so one would expect them to be mentioned in the Bible, just in the way that the HTY post-Exodus are. A stone lion relief found a Beth Shan, near the Sea of Galilee, dated to about 1700 BC, has been interpreted as confirming this identification, since lions are often pictured in Hittite art. Moreover, in the account of the conquest of Canaan, the Hittites are said to dwell "in the mountains" and "towards the north" of Canaan - a description that matches the general direction and geography of the Anatolian Hittite empire, if not the distance. Modern linguistic academics therefore propose, based on much onomastic and archaeological evidence, that Anatolian populations moved south into Canaan as part of the waves of Sea Peoples who were migrating along the Mediterranean coastline at the time in question. Many kings of local city-states are shown to have had Hittite and Luwian names in the Late Bronze - Early Iron transition period. Indeed, even the name of Mount Zion may be Hittite in origin. Some people have conjectured that the Biblical Hittites could actually be Hurrian tribes living in Palestine, and that the Hebrew word for the Hurrians (HRY in consonant-only script) became the name of the Hittites (HTY) due to a scribal error. Others have proposed that the Biblical Hittites were a group of Kurushtameans. These hypotheses are not widely accepted, however. It is also possible that the Biblical HTY refers to two distinct people at different times; e.g. a local tribe before Exodus, and the Anatolian empire after Exodus. The history of the Hittite civilization is known mostly from cuneiform texts found in the area of their empire, and from diplomatic and commercial correspondence found in various archives in Egypt and the Middle East. Around 2000 BC, the region centered in Hattusa, that would later become the core of the Hittite kingdom, was inhabited by people with a distinct culture who spoke a non-Indo-European language. The name "Hattic" is used by Anatolianists to distinguish this language from the Indo-European Hittite language, that appeared on the scene at the beginning of the 2nd millennium BC and became the administrative language of the Hittite kingdom over the next six or seven centuries. As noted above, "Hittite" is a modern convention for referring to this language. The native term was Nesili, i.e. "In the language of Nesa". The early Hittites, whose prior whereabouts are unknown, borrowed heavily from the pre-existing Hattian culture, and also from that of the Assyrian traders - in particular, the cuneiform writing and the use of cylindrical seals. Since Hattic continued to be used in the Hittite kingdom for religious purposes, and there is substantial continuity between the two cultures, it is not known whether the Hattic speakers - the Hattians - were displaced by the speakers of Hittite, were absorbed by them, or just adopted their language. The early history of the Hittite kingdom is known through tablets that may first have been written in the 17th century BC but survived only as copies made in the 14th and 13th centuries BC. These tablets, known collectively as the Anitta tex, begin by telling how Pithana the king of Kussara or Kussar (a small city-state yet to be identified by archaeologists) conquered the neighbouring city of Nesa (Kanesh). However, the real subject of these tablets is Pithana's son Anitta, who continued where his father left off and conquered several neighboring cities, including Hattusa and Zalpuwa (Zalpa). The founding of the Hittite Empire is usually attributed to Hattusili I, who conquered the plain south of Hattusa, all the way to the outskirts of Yamkhad (modern-day Aleppo) in Syria. Though it remained for his heir, Mursili I, to conquer that city, Hattusili was clearly influenced by the rich culture he discovered in northern Mesopotamia, and founded a school in his capital to spread the cuneiform style of writing he encountered there. Mursili continued the conquests of Hattusili, reaching through Mesopotamia and even ransacking Babylon itself in 1595 BC (although rather than incorporate Babylonia into Hittite domains, he seems to have instead turned it over to his Kassite allies, who were to rule it for the next four centuries). This lengthy campaign, however, strained the resources of Hatti, and left the capital in a state of near-anarchy. Mursili was assassinated shortly after his return home, and the Hittite Empire was plunged into chaos. The Hurrians, a people living in the mountainous region along the upper Tigris and Euphrates rivers took advantage of the situation to seize Aleppo and the surrounding areas for themselves, as well as the coastal region of Adaniya, renaming it Kizzuwadna (later Cilicia). Following this, the Hittites entered a weak phase of obscure records, insignificant rulers, and reduced area of control. This pattern of expansion under strong kings followed by contraction under lesser ones, was to be repeated over and over again throughout the Hittite Empire's 500-year history, making events during the waning periods difficult to reconstruct with much precision. The next monarch of any note following Mursili I was Telepinu (ca. 1500 BC), who won a few victories to the southwest, apparently by allying himself with one Hurrian state (Kizzuwadna) against another (Mitanni). His reign marked the end of the "Old Kingdom" and the beginning of the lengthy weak phase known as the "Middle Kingdom", whereof little is known. One innovation that can be credited to these early Hittite rulers is the practice of conducting treaties and alliances with neighboring states; the Hittites were thus among the earliest known pioneers in the art of international politics and diplomacy. With the reign of Tudhaliya I (who may actually not have been the first of that name; see also Tudhaliya), the Hittite Empire re‘merges from the fog of obscurity. 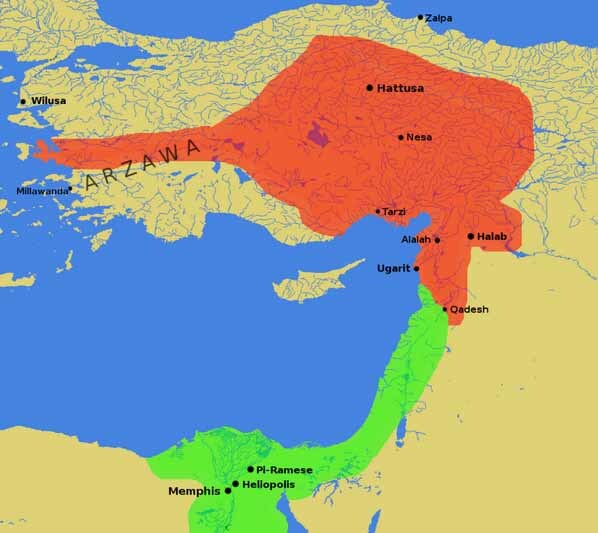 During his reign (c. 1400), he again allied with Kizzuwadna, vanquished the Hurrian states of Aleppo and Mitanni, and expanded to the west at the expense of Arzawa (a Luwian state). Another weak phase followed Tudhaliya I, and the Hittites' enemies from all directions were able to advance even to Hattusa and raze it. However, the Empire recovered its former glory under Suppiluliuma I (c. 1350), who again conquered Aleppo, reduced Mitanni to tribute under his son-in-law, and defeated Carchemish, another Syrian city-state. With his own sons placed over of all of these new conquests, Babylonia still in the hands of the Kassites, and Assyria only newly independent with the crushing of Mitanni, this left Suppiluliuma the supreme power broker outside of Egypt, and it was not long before even that country was seeking an alliance by marriage of another of his sons with the widow of Tutankhamen. Unfortunately, that son was evidently murdered before reaching his destination, and this alliance was never consummated. After Suppiluliuma I, and a very brief reign by his eldest son, another son, Mursili II became king (c. 1330). Having inherited a position of strength in the east, Mursili was able to turn his attention to the west, where he attacked Arzawa and a city known as Millawanda in the coastal land of Ahhiyawa. Many recent scholars have surmised that Millawanda in Ahhiyawa is likely a reference to Miletus and Achaea known to Greek history, though there are a small number who have disputed this connection. Hittite prosperity was mostly dependent on control of the trade routes and metal sources. Because of the importance of Northern Syria to the vital routes linking the Cilician gates with Mesopotamia, defense of this area was crucial, and was soon put to the test by Egyptian expansion under Pharaoh Rameses II. Although his own inscriptions proclaimed victory, it seems more likely that Rameses was turned back at the Battle of Kadesh by the Hittite king Muwatalli, successor to Mursilis II. This battle took place in the 5th year of Ramses (c 1275 BC by the most commonly used chronology). After this date, the power of the Hittites began to decline yet again, as the Assyrians had seized the opportunity to vanquish Mitanni and expand to the Euphrates while Muwatalli was preoccupied with the Egyptians. Assyria now posed equally as great a threat to Hittite trade routes as Egypt had ever been. His son, Urhi-Teshub, took the throne as Mursili III, but was quickly ousted by his uncle, Hattusili III after a brief civil war. In response to increasing Assyrian encroachments along the frontier, he concluded a peace and alliance with Rameses II, presenting his daughter's hand in marriage to the Pharoah. The "Treaty of Kadesh", one of the oldest completely surviving treaties in history, fixed their mutual boundaries in Canaan, and was signed in the 21st year of Rameses (c. 1258 BC). Hattusili's son, Tudhaliya IV, was the last strong Hittite king able to keep the Assyrians out of Syria and even temporarily annex the island of Cyprus. The very last king, Suppiluliuma II also managed to win some victories, including a naval battle against the Sea Peoples off the coast of Cyprus. But it was too late. The Sea Peoples had already begun their push down the Mediterranean coastline, starting from the Aegean, and continuing all the way to Philistia -- taking Cilicia and Cyprus away from the Hittites en route and cutting off their coveted trade routes. This left the Hittite homelands vulnerable to attack from all directions, and Hattusa was burnt to the ground sometime around 1180 BC following a combined onslaught from Gasgas, Bryges and Luwians. The Hittite Empire thus vanished from the historical record. By 1160 BC, the political situation in Asia Minor looked vastly different than it had only 25 years earlier. In that year, the Assyrians were dealing with the Mushku pressing into northernmost Mesopotamia from the Anatolian highlands, and the Gasga people, the Hittites' old enemies from the northern hill-country between Hatti and the Black Sea, seem to have joined them soon after. The Mushku or Mushki had apparently overrun Cappadocia from the West, with recently discovered epigraphic evidence confirming their origins as the Balkan "Bryges" tribe, forced out by the Macedonians. A large and powerful state known as Tabal had occupied the region south of these. Their language appears to have been Luwian, related to Hittite, but usually written in hieroglyphics instead of cuneiform. Several lesser city-states extending from here to Northern Syria also used Luwian, although they are sometimes known as "neo-Hittite". Soon after these upheavals began, both hieroglyphs and cuneiform were rendered obsolete by a new innovation, the alphabet, that seems to have entered Anatolia simultaneously from the Aegean (with the Bryges, who changed their name to Phrygians), and from the Phoenicians and neighboring peoples in Syria. Ironically, the language of the Lydians, spoken in the West of Asia Minor until the 1st century BC, was apparently a linguistic descendant of Hittite, and not Luwian. This and the fact that one of Lydia's kings known to the Greeks bore the Hittite royal name Myrsilis (Mursilis) may indicate that this state was the purest cultural and ethnic continuation of the former Hittites. The last trace of this language persisted until the 5th century AD, according to some Church Fathers, when it was known as the tiny dialect of Isaurian, spoken in only one or two villages. The Hittites greatly modified the system of law they inherited from the Old Babylonians. The most extensive literature that the Hittites have left us is, in fact, decrees and laws. These laws were far more merciful than the laws of the Old Babylonians, perhaps because the Hittites were less concerned about maintaining a rigid, despotic central authority. While you could lose your life for just about everything under the Old Babylonian system of laws, including getting rowdy in a tavern, under the Hittites only a small handful of crimes were capital crimes. Even premeditated murder only resulted in a fine - a large fine, to be sure, but far preferable than losing your head. They modified the role of the monarch in that they gave the king ownership of all the land under his control. Previously, under the Sumerians and Amorites, private property was allowed and the monarch only owned his own private property. Individuals were allowed control over land, which belong to the king, only by serving in the king's army. So the bulk of the population became tenant farmers. The Hittites adopted many of the gods of the Sumerians and Old Babylonians. The odd thing about the Hittites, though, is that they seemed to have recognized that all gods were legitimate gods. Whenever they conquered a people, they adopted that people's gods into their religious system. As far as history is concerned, this has tremendous consequences for the history of the Hebrews. The Assyrians seem to have adopted the same tolerance towards other religions, which allowed the Jewish faith to persist after the Jewish state was decimated by the Assyrians. And the Assyrians seem to have adopted the same tendency to adopt the gods of conquered people, so the Assyrian conquerors of Palestine adopted the Hebrew god, Yahweh, into their religion. This eventually led to the only major religious schism in Hebrew history, the schism between Jews and Samaritans. There are still Samaritans alive today.